The Cassiopeia A supernova's first flash of radiation makes six clumps of dust unusually hot as seen in this cool space wallpaper. The Cassiopeia A supernova's first flash of radiation makes six clumps of dust unusually hot as seen in this cool space wallpaper. The supernova remnant is the large white ball in the center. 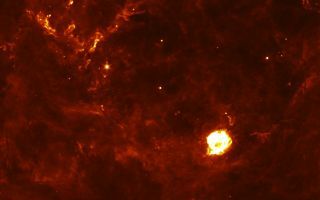 This infrared picture was taken by NASA's Spitzer Space Telescope.